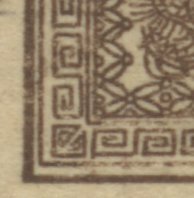 Imperforate, native laid paper, no watermark, engraved. Issued without gum. Denomination printed in black. † Gibbons distinguishes between several colour and/or printing varieties in each of the first issues. ‡ Y&T has an A/B plate variant for each value and a colour varient for the 500m. The stamps were printed using two plates for the Dragon and one plate for each value. Each plate is made up of 40 slightly different, individually engraved, images. The issue date was taken from the Scott catalog. Other authorities have used Wednesday March 1, 1871. The first issue was printed until February 1872 and remained valid until November 30, 1889. Counterfeits are plentiful, but according to Frank Aretz's book "Know Your Stamps" about 90% of the genuine stamps have a secret printers mark in the lower left. The reason it is not 100% may be related to the fact that all stamps on a plate of 40 were engraved individually. The genuine stamp shows a secret mark of two tiny dots instead of a solid line as the central downstroke of the lower Greek letter (key) in the lower left corner. The forgery has no such mark. The central characters, the denomination, in the forgery measure 9.5 mm high instead of 10.5 as in the genuine stamp. 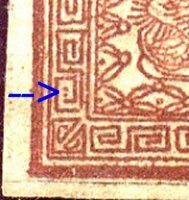 The Greek key border is more perfectly formed in the forgery than in the genuine stamp. It could be worth your while to visit Japan-Japan if you want more information on Japanese philately. China - an office was opened in Shanghai in 1876 followed by agencies elsewhere. They used unoverprinted Japanese stamps until 1900, then three main sets of overprints (with subsequent variants) issued in 1900, 1913 and 1914. Korea - similarly, an office was opened at Pusan in 1876 and others later using unoverprinted stamps. 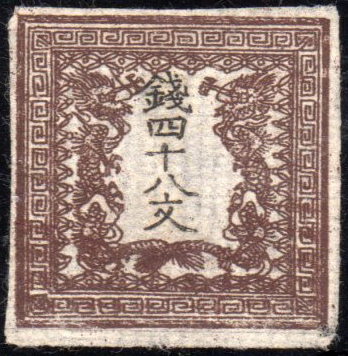 Korean and Chinese were in use, valued at par and the overprints were introduced in 1900 to prevent speculation. Images from Japan Philatelic, NickB.